There were many movie productions in 2017, from the excellent, the good, average and the not so nice – however, it has been described by many as one of Nigeria’s biggest year in movies. 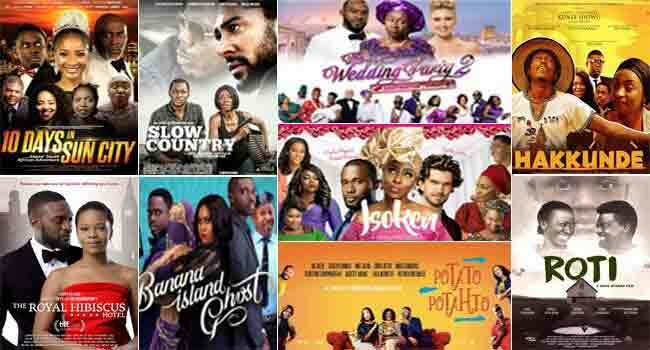 From crashing the box office to bagging awards and international screenings, many have agreed that productions in the Nigerian movie industry (Nollywood), have evolved a great deal from what used to be – cliché-ridden, flat story-lined, poor dialogue stories, coupled with a lot of technical inadequacies, to more refreshing narratives and well put together productions in general. With a lot of movies now hitting the big screens and receiving more international recognition, here are some of the most talked about and perhaps most successful movies of 2017 going by their overall reactions from the audience – in no particular order. A kunle Afolayan production that explores the pain felt by parents who lose a child they waited 10 years to have. The movie explores the idea of reincarnation when the couple, Kate Henshaw (Daine) and Kunle Afolayan (Kabir) lose their son (Roti). After several days of grief, Daine one day, finds a replica of Roti and starts to believe that perhaps he returned to her. Subsequently, she has to accept that Juwon is not Roti’s reincarnate and slips back into depression. The psychological drama is an emotional analysis of grief, mental instability and the ability to find strength to carry on with life after losing a loved one. In the romantic comedy, a disillusioned London chef (Opeoluwa) a role played by Zainab Balongun, visits Nigeria and struggles with her matchmaking mother as well as restoring the family’s rundown hotel. She’s heartbroken as she discovers her new lover, Deji (Keneth Okoli), is working on a deal to buy the hotel. An Ebony Life Films production, the movie which was directed by Ishaya Bako had its world premiere on September 9, 2017. The romantic comedy film starring Banky W as (Dozie) and Adesua Etomi as (Dunni) is a sequel to ‘The Wedding Party’, which is currently the highest grossing Nollywood movie ever. The story is about two people genuinely in love and the unnecessary interference of family members as well as the hassles of inter-cultural marriages. While the first movie explores the flamboyant Nigerian wedding culture, its sequel which was full of humour and warmth, captures the concept of destination weddings, which is gradually gaining ground amongst Nigerians. The Jade Osiberu movie portrays the family and societal pressure most Nigerian ladies go through when they are getting older and are yet to be married. Starring Dakore Akande as Isoken, many saw the movie as the perfect comeback for the actress since she has been away from acting for quite a while. Isoken was a 34-year-old charming, beautiful and successful lady whose family members began to worry about when it seemed like no responsible man was coming to ask for her hand in marriage. Eventually, she meets a man who everyone considers to be every woman’s dream and they get along fast. However, things take a different turn when she meets another young (Oyinbo) man and begins to doubt her love for Osaze, the character played by Joseph Benjamin. The Shirley Frimpong-Manso movie is about a couple – Joselyn Dumas as Lulu and OC Ukeje as Tony, who decide to live together in their matrimonial home even after their divorce. They split the compound and house into two to avoid running into each other. Things take a different turn after Tony brings in an attractive female house help. To get back at him, his ex-wife Lulu hires a hunky young man to help her out. With so many dramatic twists and turns, the couple go through the phase of trying to figure out their feelings for each other. Asurf Oluseyi’s first feature film stars the popular internet sensation Kunle Idowu, a.k.a Frank Donga as Akande, who is on a journey to self-discovery. The movie portrays the daily struggles of a job-hunting graduate and what they go through just to survive which in some cases involves doing menial jobs that do not commensurate with their qualifications. While the movie is very inspiring and teaches a lot of lessons, it manages to weave in a good amount of comedy. Such is seen in Akande’s relationship with his sister, Yewande played by Toyin Ayimakun. This action-thriller which stars Ivie Okujaye, tells the story of a homeless teenage mother, who gets herself trapped in prostitution and drug trafficking for seven years to secure a good life for her son. She decides to quit but her boss who is a ruthless human and drug trafficker is not ready to end the contract. One of the reasons for the movie’s high rating by majority of its audience is its unique genre which till date remains one yet to be fully tapped by Nigerian film makers. The movie was directed by Eric Aghimien. The comic movie directed by BB Sasore, tells the story of a ghost – Patrick, who doesn’t want to go to heaven because he doesn’t have a soulmate. After convincing God to give him three days to fall in love, he meets Ijeoma (Chigurl) who is hard to love but they eventually get along. The movie also showcases God’s relationship with his children as well his undying love. It scores high in its use of music, sound and graphic effects. This comedy-drama by AY Makun which sees Akpos on another ‘adventure (to South Africa this time around), is one that some say merely rode on the box office success of the earlier series, ‘A Trip to Jamaica’. Starring Adesua Etomi as Bianca and AY as Akpos, the movie shows Bianca as a campus beauty queen who Akpos sacrificed his livelihood to make successful. After successfully winning a national beauty pageant, Bianca, is now an international celebrity rolling with the ‘high and mighty’. Richard Mofe Damijo (Otunba) who has also invested in her, follows Akpos and Bianca to Sun city and tries to win her over with his wit and charm. He also offers Akpos a huge amount of money to give up his love. The movie remains the third-highest-grossing Nigerian film by domestic gross and is liked by 96% of its audience, according to google.